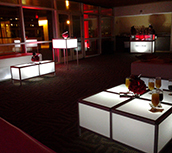 Our custom-designed glow furniture is a spectacular addition at cocktail functions, dinner parties, and other events. We’re so excited about the launch of our Ready, Set, Glow collection of event rentals. Set? For those who wish to have something fresh, modern and unique, or what we call Eventique, we give you the option to customize any of the glow collection pieces with your logo, motif, artwork, marry monogram, saying, silhouette and more. Just send us your artwork or we can create the graphics based on your theme. Leave a lasting impression…..brand everything!! Glow! Each item in the Ready, Set, Glow collection illuminates wirelessly to the color of your choice. Our battery operated LED lights produce an even glow and will last up to 8 hours. Lighting mode can flash for an energetic party; remain steady for an ultra-luxe cocktail event; or fade between colors to create an atmospheric spectacle. We also offer light up dance floors, multi-level dance stages, dance screens, and dance silhouettes. Check out our blog or Facebook for special offers or packaged specials. Our prices are highly competitive in the market and we truly believe in giving only quality services. We invite you to stop by and visit our studio to see all the new and exciting things that could make your next special event one that everyone will remember. We are transformers of event spaces and operate with no wires, no plugs, and no limitations!! Are you READY for us to SET the stage for the newest trend in GLOW event rentals?